The Human Fertilisation and Embryology Act 2008 was a major update to the UK’s laws on the use and regulation of reproductive technology and assisted reproduction. Since the enactment of the new law, the sector’s regulatory body, the Human Fertilisation and Embryology Authority (HFEA), has also consulted on various related topics including barriers to egg and sperm donation in the UK, multiple births/single embryo transfer and using IVF technology to prevent mitochondrial disease. 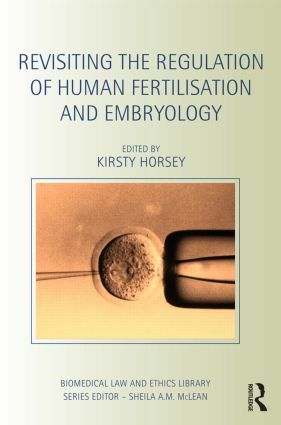 This book critically considers recent developments in human fertilisation legislation, asking whether the 2008 Act has achieved its stated aim of being fit for purpose. Bringing together a range of international experts, the book evaluates the fresh risks and challenges emerging from both established and existing technologies and techniques in the field of human fertilisation and embryology, as well as offering valuable insights into the social and regulatory challenges that lie ahead. Key topics include problems with DIY assisted conception; the lack of reform in respect of the regulation of surrogacy arrangements; and mitochondrial DNA transfer. As a review of the status of assisted reproduction legislation, this book will be of great use and interest to students, researchers and practitioners in medical law, bioethics, medicine and child welfare. Kirsty Horsey is Senior Lecturer in Law at the University of Kent, UK.